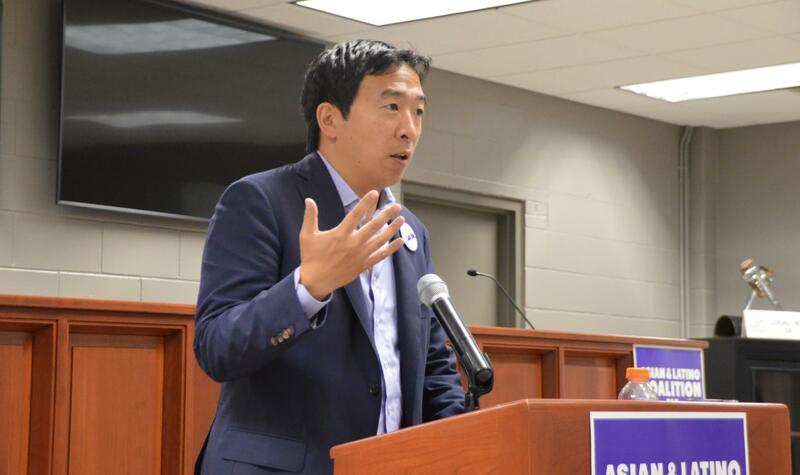 A guest post from Iowan Charlie Bell on why he’s supporting Andrew Yang for president. Now, at first glance, this probably seems like it’s a wonderful thing and, in some aspects, it is. However, it also highlights an issue that has been haunting us in Iowa for years: brain drain. According to a 2015 article in the Des Moines Register, around 50 percent of the students graduating from Iowa State University and the University of Iowa are planning on leaving the state after their graduation. This dilemma has been affecting Iowa, especially the areas outside of our ‘major’ cities (Des Moines, Cedar Rapids, Davenport, Council Bluffs, Iowa City, Sioux City, Waterloo and Dubuque) for a very long time now, and if our current economic environment continues, it will just get worse. Whether it be the factories and businesses closing up shop and leaving the Quad Cities area during the 1980s or the eCommerce and automation causing our small and medium-sized businesses to close in front of our very eyes right now, the jobs around us have been disappearing with no end in sight. But there is still one last pitch for hope, which is Andrew Yang. The Freedom Dividend will, however, serve a much larger purpose in Iowa, especially for me. I’m an 18 year old who’s preparing to go to the University of Iowa in the fall. Recently a question has popped into my head as I look into my potential major choices: where am I going to live after I graduate from college? With the lack of opportunities in many parts of Iowa, I’d say it’s pretty easy to comprehend why around half of college students going to school in Iowa aren’t staying. If the Freedom Dividend was implemented by the time I graduate from college (c. 2023), I will definitely be less worried about my financial stability if I stay in Iowa, not only because jobs will start to be created when literally everyone has extra spending money, but it would also provide a financial basis for me to build off of. In addition, the Freedom Dividend would also provide an opportunity for many Iowans to start their own businesses and pursue their childhood dreams. Some people would like to caricature this as a welfare check for all, but I don’t like framing the Freedom Dividend as free money. Instead, I like to think of it as an economic stimulus package that has the goal of putting money in the hands of normal Americans. Rather than wasting money by subsidizing corporate welfare, especially when the billionaire class has only has their own financial gain in mind, we should be investing in Americans themselves. It’s the only way to invest in our economy without the possibility of failure, because the overwhelming majority of the money given out to everyone will shortly wiggle its way into the local economy, whether it be spent on a gourmet dinner at the Iowa Machine Shed (seriously, they have the best food) or spent on an unexpected, but necessary, car repair in the middle of the winter. Realistically, there is no way to stop everyone who is leaving Iowa from, well, leaving Iowa. But I do firmly believe that we’ll see a lot more of our college grads stay in Iowa once they have the ability to not worry about whether or not they’ll have financial stability if they do choose to stay. Or maybe they will see the extra money as a way to help pay the high rent in San Francisco, thus an inducement to move to some exotic place that is otherwise too expensive to contemplate. Alternatively maybe the local employers will see a chance to minimize pay rates now that people have this other money coming in anyway.